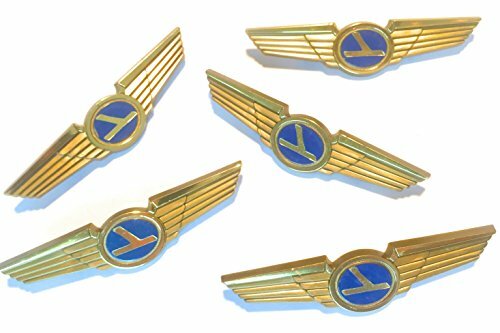 You will receive a lot of 5 Eastern Airline Aviator Plastic Pilot Pins Measure 2 1/2 inches wide by 1/2 inches tall - ORIGINAL VINTAGE STOFFEL SEALS THESE CLASSIC STYLE AVIATOR PLASTIC PINS WERE GIVEN TO CHILDREN WHO FLEW WITH THE AIRLINES! Featured in Town and Country Magazine Travel Issue! Great for Collectors, Birthday Parties and more! Locking Safety Pin on Back VINTAGE PINS- Fast shipping! Caution: Product has functional sharp points. Contact may result in injury. Always keep edges and points away from fingers and body. Warning: Choking hazard: small parts. Not intended for children under three years. Handle with care. Use with adult supervision. If you have any questions about this product by Aviator, contact us by completing and submitting the form below. If you are looking for a specif part number, please include it with your message.